No chemicals in the home/body. Over time, through research and experimentation, I’ve developed a core set of foods I prefer to eat routinely and a set of foods I avoid. These are the foods that make me feel good and through research I’ve found minimize inflammation, maximize micronutrient intake and reduce energy swings. I’ve eaten this way since mid-2015. The single most critical rule of my food lifestyle is to never let my rules get in the way of enjoying an amazing food experience. Even when eating out I try to adhere to the general guidelines above, often without anyone I’m with noticing. If that’s not possible I shut up and make do. I would rather violate a rule than be the annoying friend who can’t eat anything at a restaurant. What I don’t put into my system. What I put into my system. The quantities I put into my system. The first category is the most important and is what I recommend people spend the most time researching and experimenting with. The other two are products of my obsession with simplicity and knowing myself well enough to remove discretion from my daily eating decisions. This is my current daily food plan. It’s been mostly the same since mid-2015. To understand it read the below. What I don’t eat is derived from my operating principle, borrowed from Munger, that it’s better to avoid problems than to be great at fixing them. I’ve developed a set of food filters that help me avoid feeling bad or doing things that are well-known to lead to long-term health problems. Each of the items on my “don’t eat” list has a unique reason for being there. I didn’t seek out an off-the-shelf diet or take the word of an internet expert but rather took time to learn from primary sources (multiple large clinical studies) or experimented myself. For example, I do not necessarily believe that corn is bad. In fact, tacos are one of my greatest loves. But the modern Western diet uses corn as an artificial filler to such a degree that we overload our bodies with it, which taxes our system in a way evolution didn’t plan for. Gluten, on the other hand, makes me feel bad. Through experimentation I discovered that eliminating it help alleviate some symptoms of depression. I’ve resisted publishing my detailed reasons for each filter because I don’t want to get into arguments about science with the internet. But I do seek out disconfirming evidence like I used to seek out cheese. So please email me to talk. I use rules in various parts of my life to short circuit my brain’s tendency to implode when choice is infinite. Some people wear the same thing every day so they don’t have to think about what to wear…I eat the same thing. The logs and plans below show what I eat. Regardless of changes in my physical activity, when I am on my own, this is what I eat. I occasionally depart from my list for tacos or for a great meal with friends, but rarely break the above rules. Shopping is simpler. I can be in and out of Costco in 15 minutes, most of that in the checkout line. One of the oddest things I do (as measured by others) is consuming almost all of my vegetables as a blended beverage. Every day I blend a large Vitamix full of vegetables, no fruit except for a banana on workout days, and fill three blender bottles. Like most people sometimes I just have a salad, but I find eating salads overly time consuming. I cook once a week or so in bulk and I eat my own cooked food 95% of the time. When I’m away from my fridge or flying I generally have my own food in a bento box. I sometimes eat out, most often with friends. Eating out is a treat. But since I eat out so infrequently I refuse to eat at bad restaurants (good is not the same as expensive). Our bodies need variety and shocks to maintain immune strength and so I use routine, often weekly, fasting and the occasional molotov cocktail (something like Thai) to add the shocks. I don’t need cheat days. This isn’t a diet and I don’t feel restrained. So far, two years later, I still love what I eat. Every sweet potato is like the first. This bit relates to my training goals and my need for constraints. I started this in Oct 2015. It appears utterly psychotic to most people and it probably wouldn’t work for you. I use food to fuel my physical targets and constraining the ingredients helps me track the math. As those targets and results change, I change how I eat. The result is something that appears overly complicated but it works for me. The three day classifications are overkill. 90% of the time I eat the maintenance breakdown. On particularly hard training days I eat more of the same thing which is the training breakdown. The rest day list is for periods when I get lazy and need to lose body fat. This list helps me eliminate the probability of bad choices in weight gain or loss. Refreshed to reflect how I’ve been eating recently. This is my current daily food plan. Adjusted breakfast to provide a kickstart. The ketonic kick of a whole avocado and can of wild sardines is a great way to start my day and it’s very easy to eat while traveling. I drizzle the oil on my dog’s breakfast. Now she won’t eat without it. This is my version of Bulletproof coffee which I can’t tolerate. I add a handful of greens to help settle my stomach. Adjusted to simplify. I moved back to a high-rep, high-intensity strength plan and, frankly, food was getting too confusing. After two weeks of mild working out I’ve put on body fat and feel crappy. Need to simplify. Small modification in fat sources. The rest day overabundance of MCT Oil & Avocado in my drink was gross and made me nauseous. Replaced with chicken thighs and made a few small changes to get the numbers to balance. Then I realized I could do that on both days with a bit of adjusting. It’s worth noting that when I started eating to minimize decision fatigue in 2015 I ate nothing but boneless skinless chicken thighs for protein. I switched to chicken breasts because I followed conventional logic that strength training required tons of protein and no fat. I’ve known that to be wrong for some time. I LOVE chicken thighs. They are delicious and stay much more moist when stored than chicken breasts. I’m so excited! 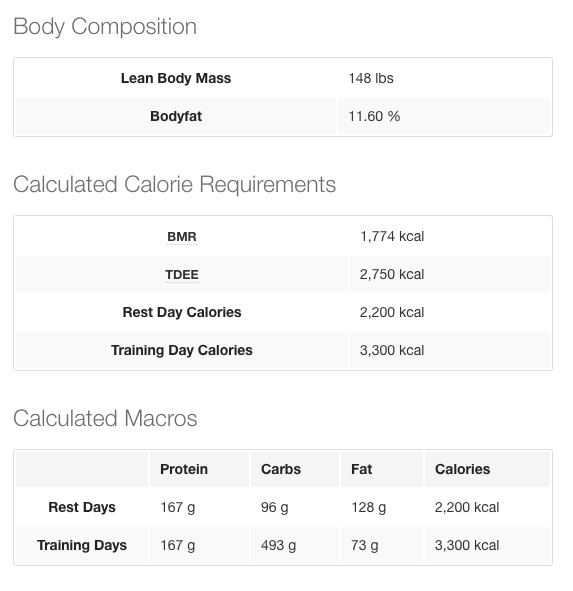 Updating calories based on change in body composition. Setting targets for lean mass gain while cutting to 10% BF. Start intermittent fasting, feed 10am-6pm. 1 Vitamix (3 x 28 ounce bottles) recipe below.